I finally got my fall decorations out yesterday. 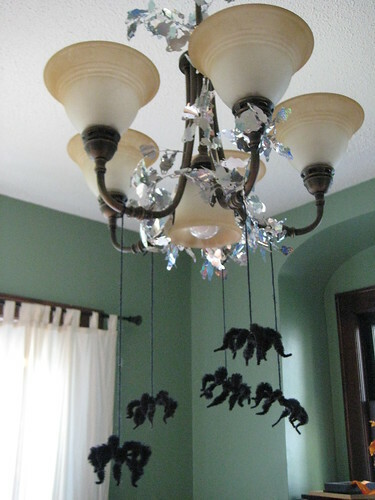 I put all the leaves into assorted vases, strung up some "Boo" silver garland, and did up my chandelier. The spiders were made by my mother, probably back when I was in 2nd grade or so. She used to help run the Halloween party at school (back when we could celebrate Halloween at school! ), and she could do a killer Haunted Laboratory, complete with brains, eyeballs, and other assorted grossness!